We are Amy and Kaycee. We are sisters and friends. 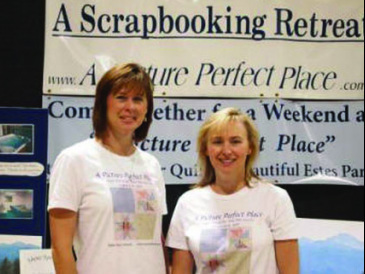 We have been scrapbooking since 2000 and this is how A Picture Perfect Place came to be. It was September 2003 and time again for our annual fall weekend crop at a local church retreat camp. Amy called Kaycee and said she had had a strange dream and began to tell her about it. As Kaycee listened she began to have a thought, “This dream seems to mean that we should open our own cropping place. We can do it better. We can do it right!” After a few discussions with our husbands and a real estate agent we began looking at properties the next week. The real estate agent thought we were nuts. Who would want to go to a place like that? Obviously she was not a scrapbooker. She quit returning our phone calls. So we both started looking on the internet for property for sale by owner. Amy found an interesting place. Kaycee found one too. We met for lunch to compare and what do you know, it was the exact same place! We went to check it out and as soon as we walked in we thought this will work great. It was setup just right. As we walked from room to room it only got better. This place is perfect, picture perfect for our scrapbooking retreat. We felt like the idea was meant to be when our families were on board too. In a matter of eight weeks, first idea (dream) to closing, we had our scrapbooking retreat. We have put a lot of hard work and ourselves into this facility and feel like it is a great place to scrapbook and to just be. We think you are going to love it as much as we do.